Small/Medium - $16.99 Only 7 left! Medium/Large - $16.99 Only 1 left! We've discovered a really amazing feature of garments like this Kids Pink Petticoat: even though they may not be the most complicated piece of an outfit, they can have the single biggest impact on the amount of fun had by the wearer. And since Halloween should be about having fun, we highly recommend that you add one of these playful skirts whenever possible. The 100% polyester pink ruffles practically beg to be twirled, and most kids figure that out pretty quickly. So your child might be dressing up as a fluffy bunny, a spring tulip, a playful kitty, or any number of other things that may not wear a pastel petticoat in the real world. But adding an accessory like this will have her dancing in whatever costume she's wearing! Add some tights for comfort in chilly weather or some ballet slippers for a little extra rotation on her pirouettes! 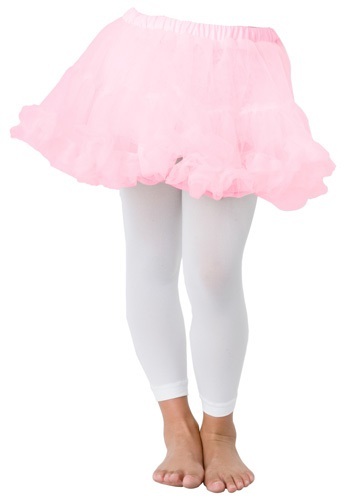 Perfect way to "puff up" the mouse costume's skirt and really make it twirl! Price is a bit high, but the skirt does the job. Fabric is soft. Size chart is accurate.